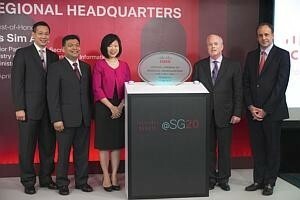 Global IT leader Cisco has officially opened its new regional headquarters (HQ) in Singapore. It also marked its 20th year of operations here during an opening ceremony held yesterday. The new office, located in Changi Business Park, will house Cisco's operations for Singapore and the Asia-Pacific region, including Japan and Greater China. Measuring 120,000 square feet, the HQ is Singapore's first fully connected and mobile workspace that spans four floors of UE BizHub East, bringing together 1,000 employees from Cisco's four previous offices around the island. Cisco's managing director for Singapore and Brunei Joshua Soh said the new HQ is a showcase of how Cisco's innovations can form the next-generation workplace. For instance, none of Cisco's employees have been allocated a fixed workspace. Instead, employees are free to go to any of the four floors to utilise any available cubicles, telepresence rooms, audio-privacy rooms or general meeting rooms. Cisco's vice-president for Asean Irving Tan explained that this would go towards providing employees with a comfortable and collaborative work environment, giving rise to higher productivity and greater creativity at Cisco. This utilisation-based space allocation applies to all employees, said Mr Tan. "I don't have a room," he assured with a smile. The decision to base its regional HQ in Singapore rather than any of the other Asia-Pacific countries was a straightforward one for Cisco. Mr Tan cited Singapore's strategic location in the centre of the region and the city-state's pro-business environment as key reasons behind the choice of Singapore as its regional base. The connectivity and multinational talent pool that can be found here also proved to be very attractive. Cisco's president and chief operating officer Gary Moore also attributed it to the rule of law and attractive ease of living in Singapore. Looking ahead, the regional office will play an integral role in actualising Cisco's strategy to increase its regional prominence in both the market and innovative developers' standpoints. Cisco has set its sights on three primary emerging markets in the region - India, China and Indonesia. "We expect Asia Pacific to grow twice as fast as developed countries," said Mr Moore.